Chiang Mai is an excellent city for exploring Thai culture and setting up a digital nomad lifestyle. There is a big expat and nomad community in Chiang Mai. This, coupled with the wealth of temples, food markets and Chiang Mai tours on offer makes it and excellent base for travellers. Chiang Mai is also a great base for visiting the Elephants. You can book tours in advance through Viator travel, but it is also easy to book Chiang Mai tours on arrival – most hotels and hostels have tours on offer. I recommend that you shop around, but certainly don’t miss the beautiful Wat Doi Suthep. With 36 Buddhist Wats (temples) within the walls of the old city alone, you could simply spend weeks, if not months temple seeking in Chiang Mai. Watching early morning Buddhist almsgiving is an extremely spiritual experience. You can walk around the city centre on your own quite easily, and learn a lot, but I found that you get more of an insight into the history and religion using a guide. I’d also recommend exploring the temples beyond the city, including the spectacular Wat Doi Suthep and Wat Inthanon. 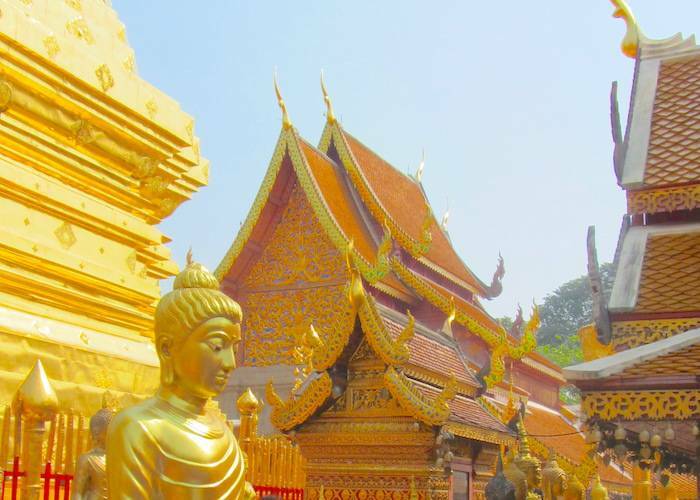 If you are feeling fit enough to trek up Wat Doi Suthep, you will arrive at the temple complex around 2pm. If you are short of time, there is a trip that covers Doi Suthep and Wat Inthanon in the same day, but it will be a long day and you may feel a little rushed and tired. Personally, I would do a day each and explore the smaller temple in the surrounding areas if possible. If you are a nature and wildlife lover, don’t miss the Elephant conservation parks of Chiang Mai. It is important that you check that the elephant park that you are visiting is ethical and treats the elephants well, rather than a money making tourist scam that allows abuse of elephants for profit. I always recommend the Elephant Nature park because it is a sanctuary for previously mistreated elephants and does not encourage elephant rides (this often results in abuse). Common areas at the Elephant Nature park have WIFI, so you can tweet, post and Instagram until your heart’s content to raise awareness about the plight of these beautiful creatures. Book your Elephant Nature Park trip in advance due to limited numbers. A one day tour will take about 8 hours and will include plenty of time with the elephants, often including baby elephants! You can do a day tour of Chiang Rai from Chiang Mai, but personally, I don’t recommend it. If you have time, spend around 3 days in Chiang Rai and do a few Chiang Rai tours from there. If you are based in Chiang Mai and have a few days to explore further afield, try one of the Chiang Rai or Rai 2-3 day tours. 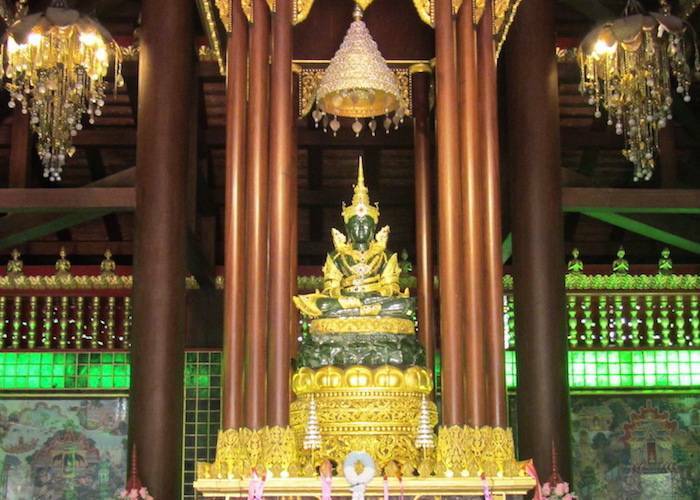 Above: Jade Buddha of Chiang Rai.